The view from Clermont’s front door is one of the most spectacular views of the Hudson River Valley from anywhere along the river. The history of the Clermont mansion is even more remarkable. 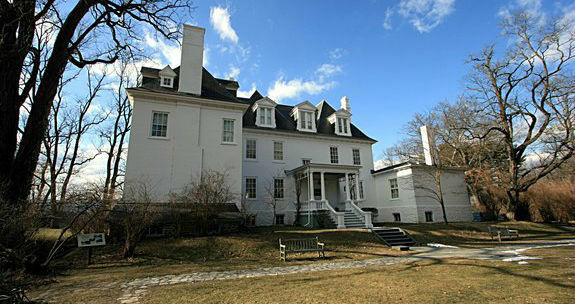 The original Clermont mansion was built by Robert Livingston around 1740 on land inherited from his father Robert Livingston, the First Lord of Livingston Manor. The First Lord left 13,000 acres to his second son, Robert, splitting them off from the rest of his 160,000 acre estate upon his death in 1728. In October of 1777 the Revolutionary War arrived at Clermont’s doorstep when a small force of British soldiers arrived, having been dispatched from New York City to offer whatever aid they could to the British army commanded by General John Burgoyne that had recently been defeated at the Battles of Saratoga. The British quickly burned Clermont and twenty four other buildings belonging to the Livingston’s to punish them for their support of the rebels. Margaret Beekman Livingston, the mistress of the house, escaped with her daughters and youngest son to a relative’s house in Connecticut before the burning. She soon returned to the property and through sheer force of will, and a constant stream of letters to New York’s governor, she was able to secure militia exemptions for enough men to rebuild the house. The most famous member of the Livingston family was Chancellor Robert R. Livingston, Margaret’s son. So called because he was New York’s first chancellor, the highest judge in the state under the original state constitution, The Chancellor was an active patriot during the war. He served on the Committee of Five to draft the Declaration of Independence, drafted the New York Constitution and served as the country’s first Secretary for Foreign Affairs. After the war he had the distinct honor of giving the presidential oath of office to George Washington in 1789. The Chancellor was also the lead negotiator of the Louisiana Purchase and the co-inventor of the first commercially viable steam boat. Clermont passed through four more generations of Livingston’s before being turned over to New York State in 1962 for use as a historic site. Every generation left an indelible mark on the house and grounds while helping to preserve the rich history held within the bounds of the estate. The current site encompasses not only the mansion, rebuilt by Margaret Beekman Livingston and added onto by later generations, but over 500 acres of landscaped gardens, meadow and woodlands, preserved for the enjoyment of future generations.